Bittrex's application for a BitLicense to allow the exchange to continue trading in NY has been denied, Bittrex has announced they will dispute this decision. An early morning Asian rally saw a brief price pop to $5400 highs, and has since sold off quickly to find support around the previous $5100~5200 level. Bitcoin has been testing previous highs all week and found resistance around the $5300 range, with the past 8 days of continuous gains slowly working gradually higher. Looking at current positioning a pullback could be in favor before the next breakout, as the order-books is looking quiet divided, with short being favored on a 1% move where as a 5% or 10% move is still long. The transactions per block have continued to stay up - after setting a fresh all time high of 2,746 on the 31st of March. We could see another all time high for transactions per block being set soon, if growth continues at the current rate of expansion, taken in mind the effect of the release of Bitcoin Core 0.18 and the Lightning networks advancements such as total active nodes now being over 4000 - Q2 is really starting to look very interesting for BTC. 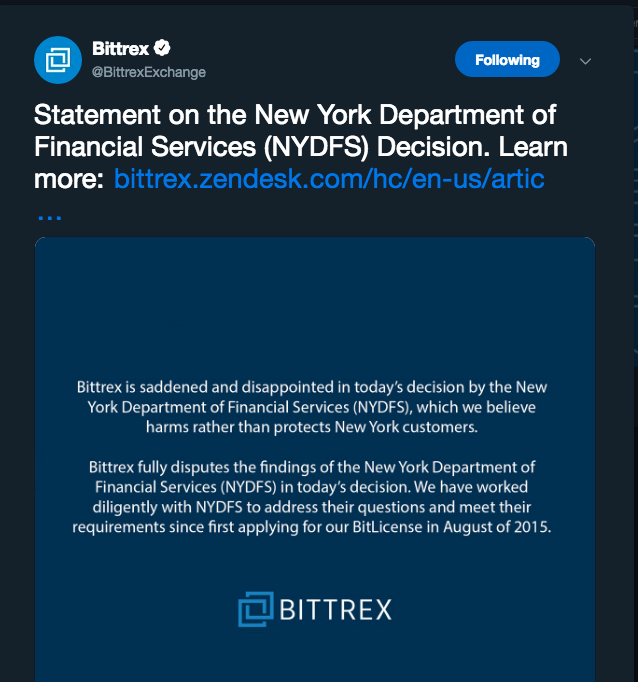 Popular altcoin exchange Bittrex has been denied it's BitLicense that was required to continue operation in New York, and has announced on their twitter they will dispute the decision.